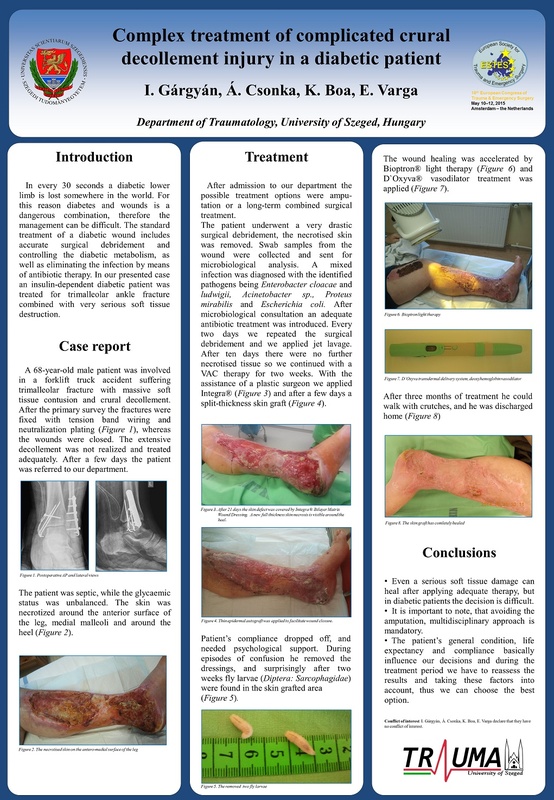 Prof. Endre Varga MD from the University of Szeged, Hungary presented the case study titled "Complex treatment of complicated crural decollement injury in a diabetic patient" at the 16th Congress of the European Society for Trauma and Emergency Surgery, which was held in Amsterdam from May 10 – 12, 2015. This congress was organised in cooperation with the Dutch Trauma Society. The Motto of this meeting was: “SAVE LIVES, SHARE KNOWLEDGE”. Professor Endre Varga MD (habil) PhD (med) from the University of Szeged in Hungary presented the results of a case study on Necrotizing Soft Tissue Infection in a poster session at the 16th Congress of the European Society for Trauma and Emergency Surgery in Amsterdam, the Netherlands. This event has covered a wide variety of topics in Trauma and Emergency Surgery, such as Trauma Systems, The Acute Care Surgeon, Endovascular intervention or surgery: Who Stops the Bleeding, Acute Management of pancreatic injury and disease, Shock control and management, Evidence Based Trauma and Acute Care, Necrotising soft tissue Infections, New Technologies in Trauma and Acute Care, Polytrauma, Truncal Trauma, Burn injuries and many others. Colleagues from over the world attended and contributed in sharing knowledge about prevention of and caring for trauma and emergent care patients. In every 30 seconds a diabetic lower limb is lost somewhere in the world. For this reason diabetes and wounds is a dangerous combination, therefore the management can be difficult. The standard treatment of a diabetic wound includes accurate surgical debridement and controlling the diabetic metabolism, as well as eliminating the infection by means of antibiotic therapy. In our presented case an insulin-dependent diabetic patient was treated for trimalleolar ankle fracture combined with very serious soft tissue destruction. A 68-year-old male patient was involved in a forklift truck accident suffering trimalleolar fracture with massive soft tissue contusion and crural decollement. After the primary survey the fractures were fixed with tension band wiring and neutralization plating (Figure 1), whereas the wounds were closed. The extensive decollement was not realized and treated adequately. After a few days the patient was referred to our department. The patient was septic, while the glycaemic status was unbalanced. The skin was necrotized around the anterior surface of the leg, medial malleoli and around the heel (Figure 2). After admission to our department the possible treatment options were ampu-tation or a long-term combined surgical treatment. The patient underwent a very drastic surgical debridement, the necrotised skin was removed. Swab samples from the wound were collected and sent for microbiological analysis. A mixed infection was diagnosed with the identified pathogens being Enterobacter cloacae and ludwigii, Acinetobacter sp., Proteus mirabilis and Escherichia coli. After microbiological consultation an adequate antibiotic treatment was introduced. Every two days we repeated the surgical debridement and we applied jet lavage. After ten days there were no further necrotised tissue so we continued with a VAC therapy for two weeks. With the assistance of a plastic surgeon we applied Integra® (Figure 3) and after a few days a split-thickness skin graft (Figure 4). Patient’s compliance dropped off, and needed psychological support. During episodes of confusion he removed the dressings, and surprisingly after two weeks fly larvae (Diptera: Sarcophagidae) were found in the skin grafted area (Figure 5). The wound healing was accelerated by Bioptron® light therapy (Figure 6) and D'Oxyva® vasodilator treatment was applied (Figure 7). After three months of treatment he could walk with crutches, and he was discharged home (Figure 8). Even a serious soft tissue damage can heal after applying adequate therapy, but in diabetic patients the decision is difficult. It is important to note, that avoiding the amputation, multidisciplinary approach is mandatory. The patient’s general condition, life expectancy and compliance basically influence our decisions and during the treatment period we have to reassess the results and taking these factors into account, thus we can choose the best option. Please visit http://www.MyInvisiDerm.com and send your general inquiries via the Contact Us page, or for specific inquiries contact InvisiDerm Public Relations at pr(at)myinvisiderm(dot)com or by phone at +1(626) 817-6685. This press release may contain forward-looking information. This includes, or may be based upon, estimates, forecasts and statements as to management’s expectations with respect to, among other things, the quality of the products of InvisiDerm Healthcare, its resources, progress in development, demand and market outlook for noninvasive transdermal delivery medical devices. Forward-looking information is based on the opinions and estimates of management at the date the information is given and is subject to a variety of risks and uncertainties that could cause actual events or results to differ materially from those initially projected. These factors include the inherent risks involved in the launch of a new medical device, innovation and market acceptance uncertainties, fluctuating components and other advanced material prices, new federal or state governmental regulations, the possibility of project cost overruns or unanticipated costs and expenses, uncertainties relating to the availability and costs of financing needed in the future and other factors. The forward-looking information contained herein is given as of the date hereof and InvisiDerm Healthcare assumes no responsibility to update or revise such information to reflect new events or circumstances, except as required by law. InvisiDerm Healthcare makes no representations or warranties as to the accuracy or completeness of this press release and shall have no liability for any representations (expressed or implied) for any statement made herein, or for any omission from this press release.